Okay, so this is not real cooking. But it is fun. A great kids party treat. I remember being in hospital as a kid and I got to eat jelly and custard for dessert most nights. So this recipe is a little modern take on that. I found this recipe in a cookbook recently and I thought my kids would like it (I was right). 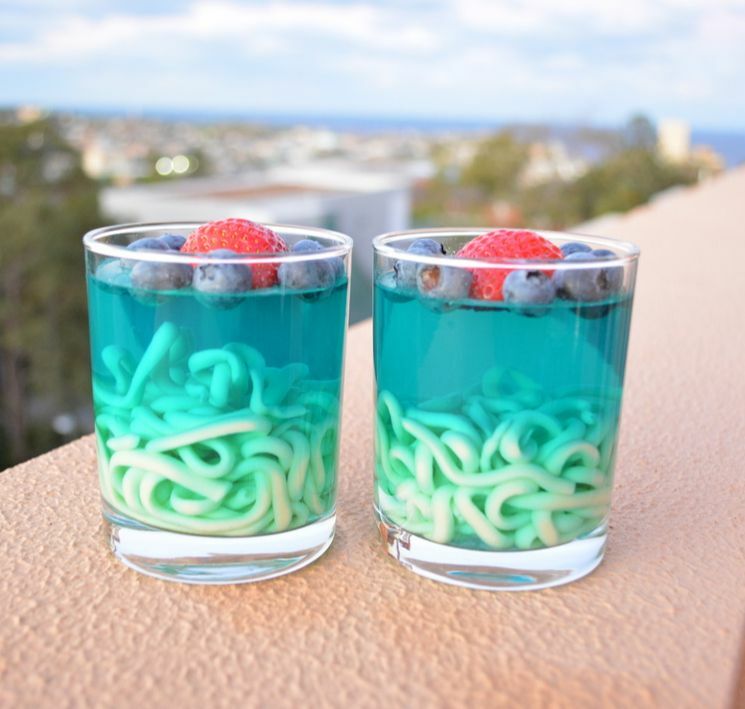 At first they thought yuk, noodles in jelly, but when I told them it was custard they tried it and loved it. Now I use a thick store bought custard here, so I put the custard in a snap lock bag, cut a small hole into one corner and pipe the custard in. It is amazing how the custard keeps its shape after entering the liquid jelly. But if yours is a more runny custard, you can pour it straight from the pack, it won't keep its shape quite so well, but it will still look good. 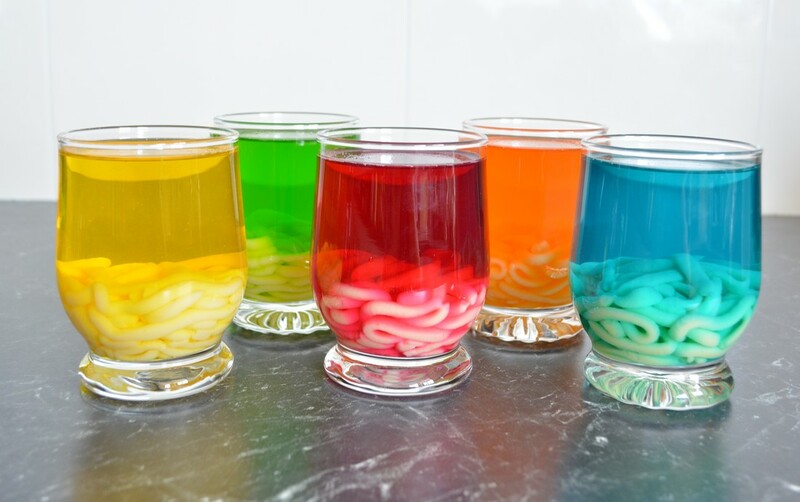 You can use whatever flavour jelly you like. The red jelly is great for Halloween, the custard looks like brains. Also I use 1 cup (250ml) size cups, but if you use 3/4 cup (180ml) size cups you will get 6 servings, which is better for parties. This is a cool party treat or a quick dessert. My kids love it, hope yours do to. Pour the jelly crystals into a large measuring jug. Pour in the boiling water, stir well, until the jelly crystals have dissolved. Pour in the cold water, stir. Leave on your kitchen counter for 45 min to 1 hour until it cools down. Once the jelly has cooled, pour evenly into your 3 glasses. Place the custard in a snap lock bag. Cut a small hole in one corner. Now pipe the custard into the jelly mixture, making squiggly noodle shapes. Cover the glasses with a small piece of cling film. Refrigerate, at least for 4 hours or until the jelly has set. 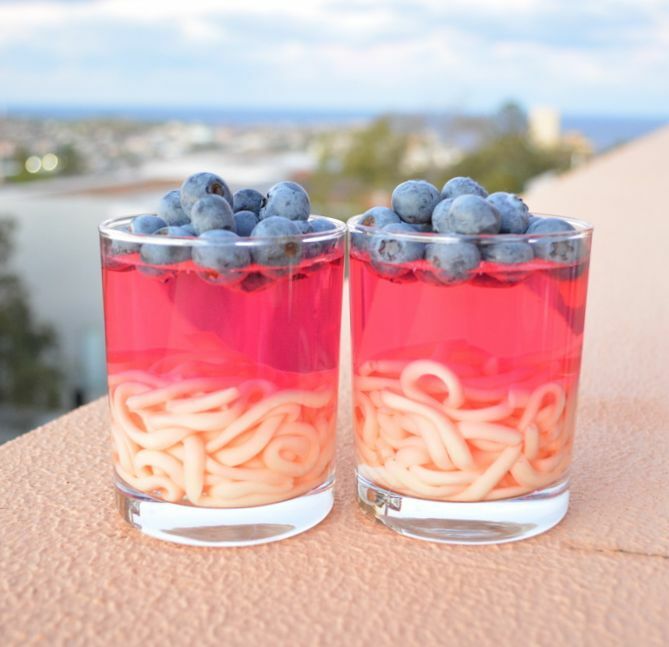 Once the jelly has set, place a strawberry half on each jelly, scatter over the blueberries.